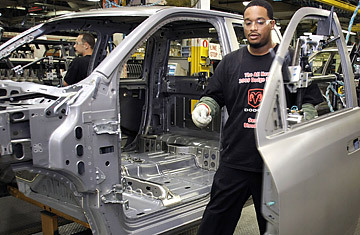 A Chrysler employee installs a door on a Dodge Ram as it goes through the assembly line at the Warren Truck Assembly Plant in Warren, Mich. Under pressure to demonstrate their viability in order to qualify for more government loans, General Motors and Chrysler couldn't produce any additional evidence on Tuesday. If they were taking physical exams, they both would have flunked. Both companies are running low on the money they need to operate. GM ended the year with $14 billion, about what it needs to keep the lights on. Chrysler was forecasting that it would start March with just $2.4 billion. Without a boost from the government, GM and Chrysler could each be forced into bankruptcy or liquidation by the time the crocuses bloom. Adding injury to insult, Standard and Poor's reiterated its sell opinion on shares of GM, which are commanding a mere $2.04 a share  about the price of a subway ride in New York City. Observing that the industry is gripped by an "automotive depression," S&P's Efraim Levy added, "We do not foresee an uptick in industry demand before Q4 '09 at the earliest." Chrysler was spared a similar indignity because it is privately held. The two companies are seeking $21.6 billion in emergency loans on top of the $17.4 billion they have already received. But both are missing two pieces they must have by March 31 to convince the government that they are viable: approval from bondholders to restructure their debt and approval from the United Auto Workers to restructure their health-care agreement. Complicating the problem, the bondholders and the UAW are keeping a close eye on each other to make sure that neither side gets a better deal. With the Obama Administration taking heat for enormous deficits in the budget it is proposing, this automotive impasse can only increase the pressure on the Treasury Department to forget about further loans, pull the plug on the two companies and force them into bankruptcy. In bankruptcy court, a judge could impose terms on both the bondholders and the autoworkers. In addition, the judge could renegotiate contracts with suppliers and ignore state franchise laws that protect dealers from termination. The automakers complain bitterly that bankruptcy would destroy their corporate reputations, turn off customers and be ruinously expensive as well. But as the March deadline gets closer and matters remain unresolved, it increasingly looks like a straightforward if brutal solution. It isn't as if the auto companies have a huge reservoir of public affection from which to draw. Outside of some Congress members from Michigan, Ohio and Indiana, there haven't been many voices speaking out with any variation of "Save Detroit." See photos of the remains of Detroit. See photos from the 2009 Detroit Auto Show.